I like using [Card Cues] because they’re an inexpensive and quality (thick and glossy) solution. I’ve been hanging business cards on local bulletin boards for years and one of the problems is when a perspective customer comes along and takes the card… my advertising on the board is gone. With these things, I can stuff 35-40 cards in the holder and have them hanging on a bulletin board (in roughly the same footprint as 2-3 cards) where they’ll KEEP advertising for me even AFTER a bunch of potential customers have taken a card. If nothing else, I don’t have to keep revisiting the same bulletin boards a few times a week to pin more individual cards up. But besides the time savings – I really think I’ve garnered more work because of them. Software developer Ned Batchelder created a tutorial that shows you how to make a business card cube out of existing business cards. 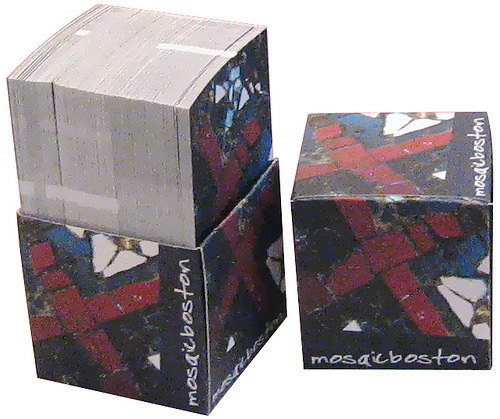 Unfortunately, you have to waste a few business cards to make the cube, but at least you don’t have to actually buy any additional items (you could always use some old business cards to make the box). Unfortunately, Etsy seller lostmitten sold out of these creative business card displays in May of 2007, but who knows what a little begging and pleading might get you. 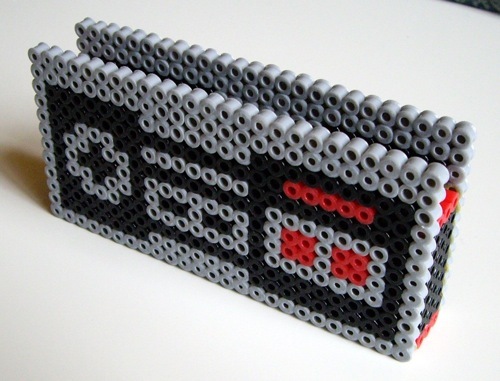 Plus if you’re really ambitious, you could put your own spin on the design and make your own custom display out of perler beads or Legos. Designer and Flickr user chesterfly came up with the interesting idea of using Prince Adam’s alter ego (a.k.a. 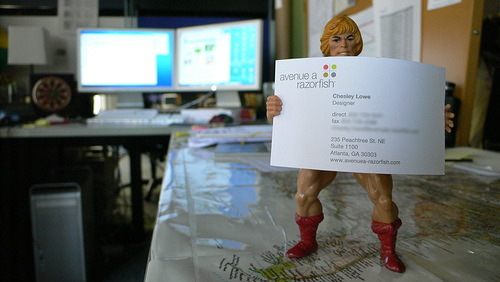 He-Man) as a business card holder. You could dig through your old junk or take a trip to the local thrift store in the hopes of finding your favorite childhood action figure (where’s that die cast Voltron when you need it) and putting it to work. Of course, this idea may not be feasible in certain situations but it’s a unique solution nonetheless. 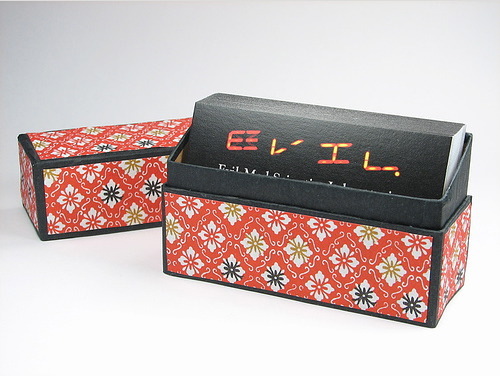 Lenore Edman’s Japanese Papercraft box tutorial has all the information you’ll need to create your own custom business card display box. Although this particular design is a bit more labor intensive, it is completely customizable to match your company’s logo and branding. It’s basically just one piece that wraps around and has a slit in it, then a bottom and another little shelf for the top section; nothing too fancy. The pieces have tabs which made it easier to glue them together. Again, this design is completely customizable and there is also a “Leave Yours” slot where potential customers and fellow business owners can leave their business card for networking and collaboration. Fellow blogger tango! has created a template and tutorial for making your own business card holder out of the free paint chips that you find at home improvement stores. Just about any thick paper can be used so the design can be easily modified to suit your needs. Designer and cartoonist Matt Hawkins created the C3 business card holder for his department at work. 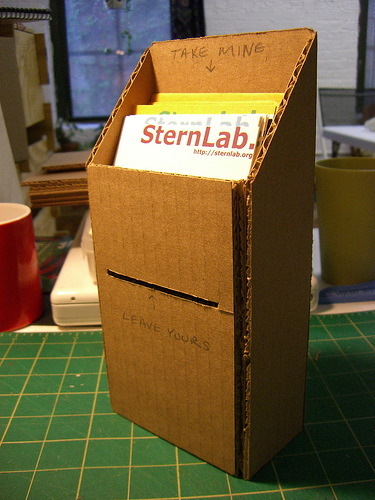 The body of the robot opens up and acts as additional business card storage. Although this particular item is a one of a kind creation, you could try getting in contact with Matt to see if he would be willing to implement a custom design for your own business card display. 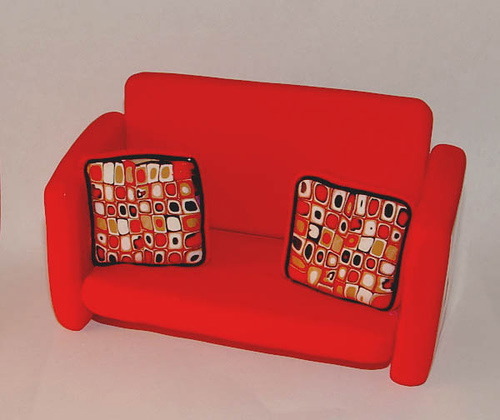 Etsy seller Posh Pretties has been making and selling polymer clay items for over a year, and she is more than willing to try her hand at custom orders. 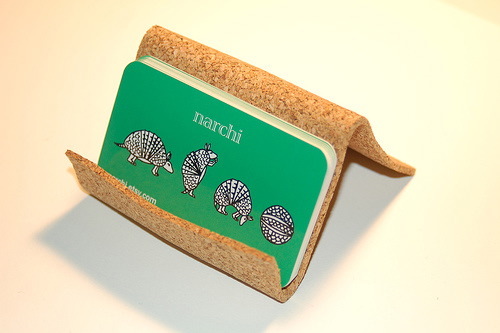 Last but not least, Etsy seller narchi created this simple business card display out of cork. As with several of the designs above, this is an eco-friendly alternative that is easily customizable. By now you’re either inspired to put your own spin on a unique business card display, or you’re overwhelmed by all your options and will instead opt for a regular display. 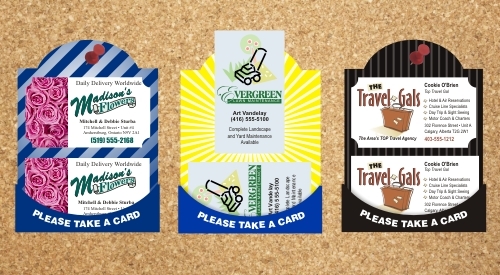 Regardless, using your business card to advertise your business is something that is easy and inexpensive to do so be sure to take advantage of any opportunity to make your business cards and business card display stand out from the rest! So what do you think, do you have any ideas or tips for a unique business card display? If so, feel free to leave a comment! I totally dig some of these “solutions.” I will most definitely be going through my action figure collection tonight. 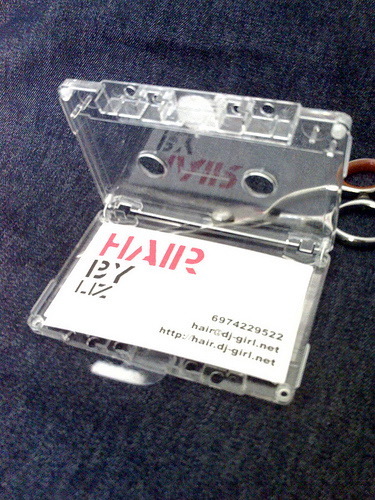 One of the most unique business card displays i’ve seen is here… http://www.freecard.com . This company has found a system to make money with the displays as an actual business. It’s worth taking a look at… clever idea in my opinion. The ideas are so cool.. I can’t even imagine it before!!! @1 Button To WiFi Chick – Glad to hear that this inspired you to update your card holders! BTW, here’s another great idea for a card holder that isn’t being used as a card holder yet: Dragon Illusion. The optical illusion is amazing! If you wanna see over 50 Unique Business card displays and dispensers check out http://www.AdPockets.com. 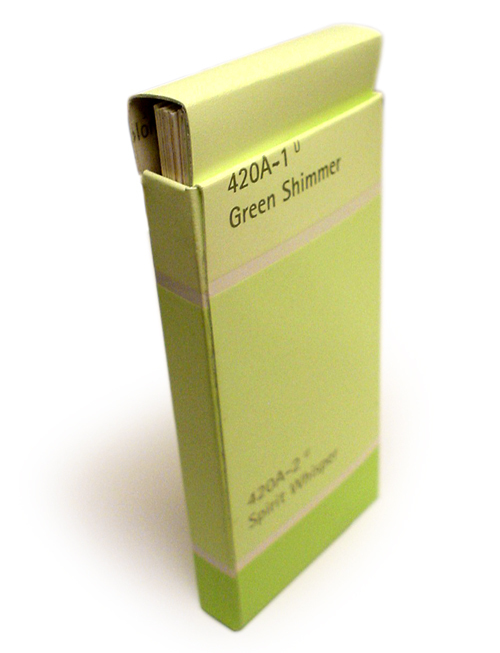 AdPockets is the largest manufacturer and designer of business card displays on the planet. Card cues is apparently OOB… what’s up? @Shawn Frey – That’s news to me, where did you hear about Card Cues being out of business – care to share any details? I contacted Card Cues customer service and it was communicated to me that they’re currently experiencing server outages due to issues that arose after a server migration. I don’t believe they’re OOB. Not sure if Card Cues is out of business, at one time they were being looked at by a company to sell the Card cues exclusive IE office max type store or something like that. I’ve had better success having the Post a Card Company a sister company of the AdPockets above do my card holders. Beats the pants off the card cues, I wanted something alittle custom. Not for everyone but i hate printing my own stuff. These are paper and can do anything hold about 50 cards can hang or stick or stand on a counter. CardCues is alive and well… so relax with the rumors – it appears to have been a simple website glitch. I’ve personally used CardCues and they work great – and no offense Chad but CardCues cost a fraction of what you’re advocating. Incidently, you can buy them online easily but I hope they do eventually wind up in a big box store. It would be nice if they’re distribution was wider and more readily accessible. Thanks for the feedback guys. I see Card Cues is back online. I originally heard about them from John Jantz over at duct tape marketing. I had not heard of Post A Card before but am planning to check them out tonight. @deb – That’s awesome, thanks for the link! @Chris – Thanks for the link, I found a nice business card guide on his site that I bookmarked for future reference. I was inspired by the business card display made out of business cards and decided to modify it a bit. I have written a tutorial on my website: http://www.youngbusinessowner.com/ . If anyone decides to make one, I wouldn’t mind if you sent in a picture! @Chris Palko – Great tutorial you put together, thanks for sharing! @Maureen – How crazy, I just came across that idea last week when I had an empty pack sitting right next to some business cards! I guess great minds think alike. The interesting thing is that only a few people have actually blogged about it online, but I guess I can add to the fray with a blog post of my own. I’ll bet the reused cardboard and the cork displays are popular now with everyone going green. The cork display’s modern styling doesn’t hurt it either! 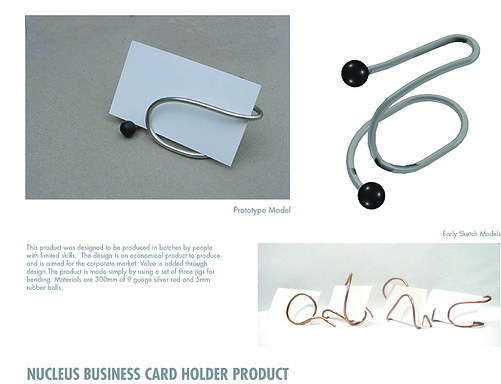 There’s a good article about business card holders and displays at ArticleTrunk. I bought some card cues this Summer after my original post here. They work well and they are STILL working. No one yet has thrown them in the trash. I only have them up on (2) bulletin boards. Very cheap advertising. @yusee – It’s interesting that you say that, because I’ve wondered how effective business cards truly are. I really think it depends on the person; for example, I actually keep every business card I’m given and they’ve come in quite handy when I need to get a hold of someone. My second resource is usually someone’s blog or Facebook page, but that’s only if I can remember who the person is. As for giving out business cards, I’ve been in situations where I don’t have a business card handy and suggest that they find me via a Google search for my name or blog. I have yet to hear from someone who has been given that advice. On the other hand, I have actually received several emails from individuals who I’ve given a business card to. In my experience, telling someone you find via a website or search actually presents more complexity into the equation. Plus, from a personal branding perspective, sending someone to another website instead of your own personal website doesn’t seem like such a good idea in my opinion. I agree. I even put my cards on sticky-back magnets. My customers and prospects hang on to these for a very long time. LOVE the He-Man one. Kind of want to steal that idea for myself. I like the action figure idea! I had to develop another type of display idea for a trade show, business card display and drop box, as none of these fit my needs exactly. You can see the pic by following the link above. Great stuff – thanks for all the info and inspiration! Aww these are cute especially that one box where you can leave your own business card as well. Thanks for the collection. I think it’s too much original! Simple business cards but original and elegant! Have a look! I like the card cues. 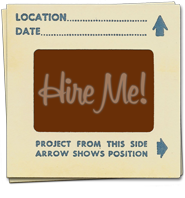 Thanks for the Carddemand link, similar to http://www.thecardboard.net, another online business card bulletin board/display. Had so much fun using the ideas here~ thanks for the creative ideas! I love this site! Thank you, such great ideas! !